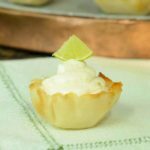 A recipe for Key Lime Pie Bites, little tarts made with fresh key limes, cream cheese, condensed milk, cream and fillo (or phyllo) mini tart shells. Beat cream cheese, condensed milk, zest, and juice in a large bowl until smooth. Beat heavy whipping cream in a separate bowl until stiff peaks form. Pipe or spoon filling into filo shells. Optional garnish: thinly slice key limes (about 1/8-inch thick). Cut the slices into quarters to make wedges and remove seeds. Place a wedge on top of filling. Chill until serving. Best served same day as prepared.